Pocket Aces – Play or Fold? In late March, after the run-up in S&P 500, Bullish sentiment had improved and we were within 3% of our all-time highs. We advocated that traders pare back equity positions given seasonal weakness and a plethora of headline risk. Today, the S&P 500 is marginally higher, however, it has not yet broken out to new highs. But it will. This will be the year that the “sell in May” thesis fails. 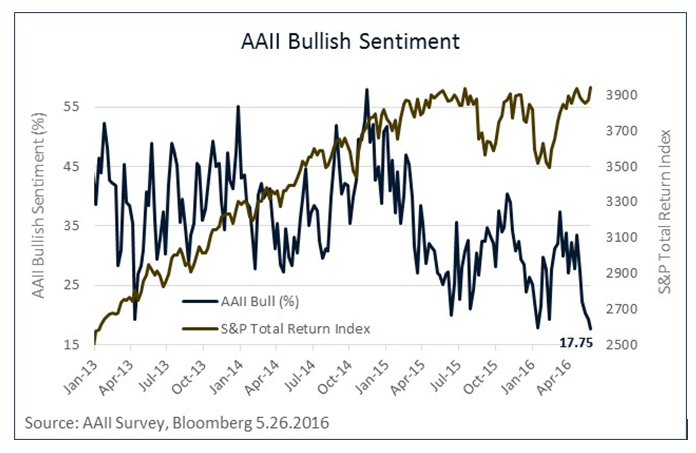 Bullish Sentiment, released by the AAII Survey on Thursday, registered a 17.75 reading, the lowest since April of 2005, and the second lowest in the last 24 years. The lack of bullishness represents a significant divergence from a market that continues to climb higher, and it should not be ignored. Traders should prepare for a strong equity market over the next six months regardless of the election outcome, a potential Brexit, and Fed maneuvering. These risks are already priced into the market. For the small cohort of Bulls out there, history is on your side. 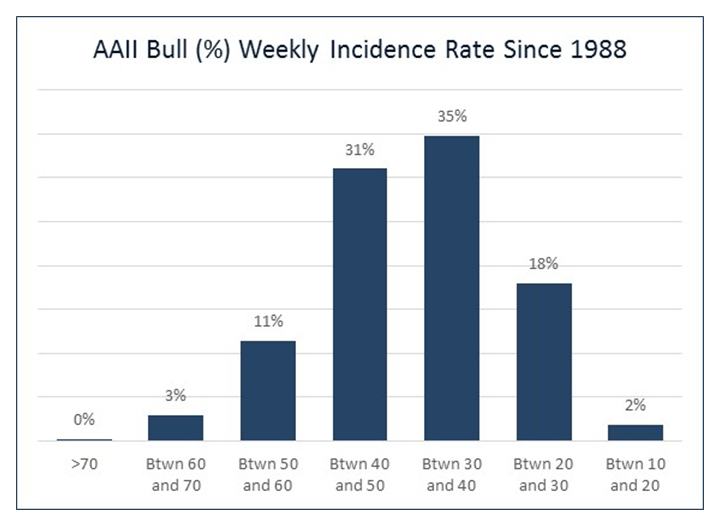 The AAII Bullish sentiment reading rarely dips below 20, and when it does, it has been a good time to invest — at least over the next six months. The chart below illustrates the six-month historical performance of the S&P 500 at specific AAII Sentiment levels. 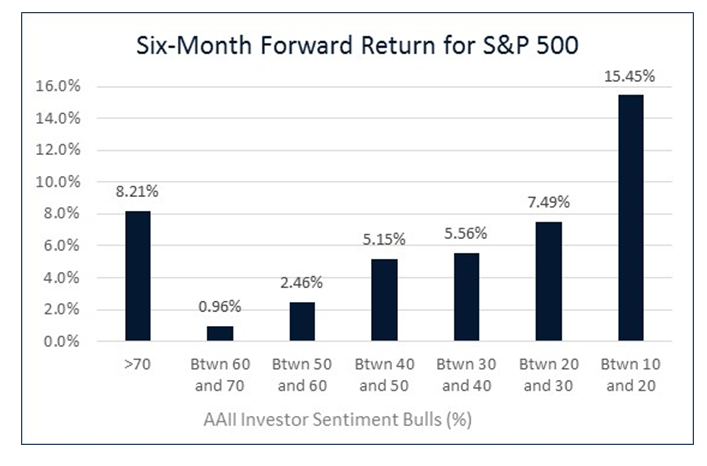 When Bullish sentiment is between 10 and 20 percent, the average six-month gain is a whopping 15.45%. Moreover, this reading is incredibly rare. It occurs only 2% of the time, eclipsed only by hyper-bullish readings above 70% that are so rare, I almost didn’t include them in this analysis. Does this guarantee that we will be positive over the next six months? No. Are you guaranteed to win at Texas Hold ‘em with pocket aces and an ace showing? No, but your chances are mighty high. 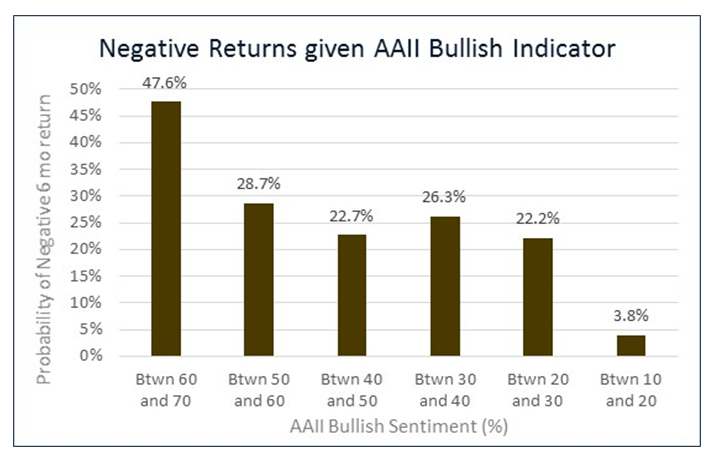 The chart below shows that when there is such a low reading for the AAII Bullish Sentiment indicator, the market has been negative over the next 6 months only 3.8% of the time. The worst return when this indicator was such depressed levels was -10.6% in January of 2008 when the indicator was at 19.6% Bulls. Over the next six months, market pundits are going to continually question why this market keeps moving higher. They will try to pinpoint fundamental reasons why the equity market is undervalued, or that economic conditions are improving. These may be true. They may not be. But the reason we will move higher, is because of positioning. Bearishness prevails, and the street is underinvested. If you have any doubts about the pervasive bearishness that currently exists, just read the comment section in response to this post.